Are you visiting Osaka for the firs time? Are you having a trouble deciding which area to stay? Maybe you can use some of my local tips and advice! When choosing a hotel in Osaka, you should alway think what your priority is. Is it to go check out every tourist spots? or enjoying not only Osaka but also Kyoto. Here is my advice how to choose the best hotel for you. I'm quite sure most of travelors wants to see it all. When you visit Osaka, you will be surprised how much you have to walk. Namba is in the middle of cool spots like Dogenzaka, America Mura, and Shinsaibashi. You can just walk there and when you get tired or have too much souvenir to carry, you can always come back and rest. It takes only 15 minutes to Osaka Castle and Shinsekai area and 30 minutes to Universal Studio by train. I can say Namba is the best location where you can enjoy the deep Osaka life and visit other tourist spots easily. Also, it only takes 30-45 minutes to go to Kansai Airport by Nankai line, and only 15 minutes to JR Shinosaka (where you get on/off for Shinkansen). Whether you are taking a flight or Shinkansen to get to Osaka, Namba would be a good area. I actually JUST stayed at this hotel and I loved how it was in a great location. It is just behind of Namba Grand Kagetsu which is a comedy theater. You cannot expect a big room since it is a business hotel, but the customer service was good and the room was clean. I also loved how easy check out was - all you needed to do is drop off the key when you leave! I bet you have seen it on YouTube or news. If you're on a budget and still wants to stay in a clean hotel, this might be a choice for you. First Cabin Hotel is like a first class capsule hotel. It is a tiny tiny room but it is not that bad. Many capsule hotels are prohibited for man but First Cabin offers woman's floor. Osaka locals call this Area 'NORTH' which is very accessible to Kyoto. If you can hop on Shinkaisoku(express), you can get there in 30 minutes and cost you only ¥560 (roughly $5.00) . There is shorter route from Shin Osaka to Kyoto by Shinkansen which only takes 15 minutes, but it cost ¥3020 (roughly $26.50). If you have time, I recommend going from Osaka Station. Also, this area is the biggest hub in north Osaka. You can simply get to any tourist spots without transit. Namba area, Osaka Castle, Shinsekai, and Universal Studio is all in 15 minutes far. NORTH is filled with modern buildings and shopping centers like Grand Front Osaka and Osaka Station City. If you are into architectures and shopping, you will be happy there. The highlight of this hotel is that it has a direct access from Osaka Station. The best location EVER! In this area, good quality hotels are located a bit far from the station (well, I consider it is far when a hotel is 7-15 minutes walk distance), so I would say among all of the equivalent ranked hotels, this is the best one. It is a bit expensive for business hotel but as long as you book it early, it's not too bad. I love their great view and comfortable bed! They also offer a plan with Universal Studio 1-Day Pass so you should definitely check it out if you plan to go. Universal City would be your best choice if you are planning on spending time at USJ from the morning till late night. Universal City is a bit far from other tourist spots, but it's not all less than 30 minutes. There are several USJ Official Hotels where you can buy different types of park tickets and goods. I can't deny that hotels in this area is a little more expensive but I'm sure you will enjoy the magical time there. If you are on a budget and wants to stay somewhere close to Universal Studio, I recommend Bay Area or Osaka/Umeda Area. This is one of the USJ official hotels. As you can see in the picture below, it is RIGHT in front of the main gate of the park. 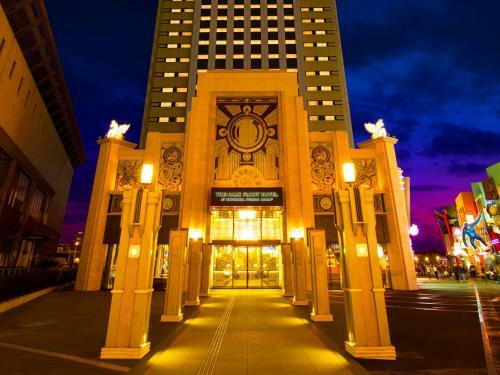 Universal Tower is also an Universal Studio official hotel which is right by the park. The highlight of this hotel is onsen on the top floor! It will help you relax after all-day of walking. I hope this hotel guidance helps you decide where to stay. Let me know if you have questions.